Together with the Aarau general planner suisseplan AG, the Zurich architecture firm Vehovar & Jauslin has drawn up a project that essentially consists of four areas: the underground Einstein Passage, the adjacent Hächler Hall, the train station forecourt and the bus station with its canopy. The formerly unattractive and poorly illuminated pedestrian underpass was an important connection between the train station, on the one side, and the city center and the cantonal school on the other. Fresh materials and new uses ensure that the tunnel feels safe and comfortable for the numerous commuters and passers-by, despite insufficient daylight. The highlight of the new Einstein Passage is surely the interactive light installation Gravity, which the architects developed together with lighting designer Rolf Derrer. The underpass is illuminated by continually changing colorful letters and multilayered patterns. Special sensors register the movements of the pedestrians, enabling the light show to change, depending on the season, weather and time of day, thanks to artificial intelligence. The restoration of the the underground hall carried out within the existing spatial proportions transformed the hall into a pleasant passageway and space to linger. Pairs of new columns, which were structurally necessary, form gondola-like benches that are clad in warm red. Neutral colors and a light-colored floor frame the expertly refurbished relief. As part of the reorganization, the forecourt of the train station was completely redeveloped. The result is an orderly, open square with a bus station at its center. 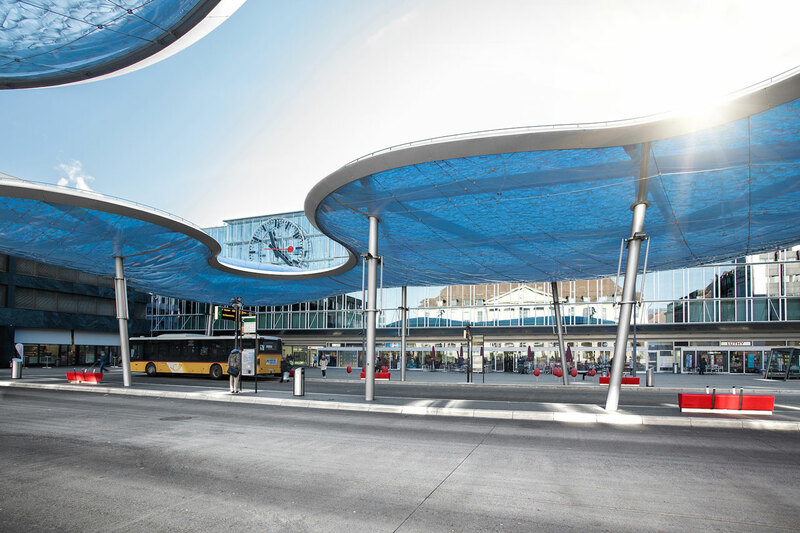 The image of the new station forecourt is unquestionably defined by the roof over the actual bus terminal, a canopy that the locals already affectionately call the “cloud.” Its organic shape with a clear view to the sky at its center originates from the desire to not place an upper limit on the square, but to welcome travelers in a friendly and bright environment. The air-supported membrane cushion made of the synthetic material ETFE is held up from within by a freeform steel construction. An irregular network of steel cables across the outer surfaces gives form to the air cushion. The necessary utility lines for drainage, lighting, recirculating air and measurement technology run invisibly inside the construction. Thus the roof appears light and airy instead of looking like a technical installation.